I’ve started designing a sweater. It’s knitted lace which is pretty new to me, but lots of fun. Anyway I’ve pull some yarn from my stash like a good girl. I found some beautiful, thin weight, black, 100% wool yarn. I think that’s perfect. I start knitting with it to discover black smudges on my fingers. The dye is actually transfering onto my hands! Needless to say I had to return to the stash to find some different yarn. I can’t imagine knitting with wool that keeps staining my fingers. Any thoughts on what I can do fix the yarn so I can use it? I thought about wrapping it back into skeins and washing it in cold water and vinegar. It would be a lot of work, but if it worked I think it would be worth it. 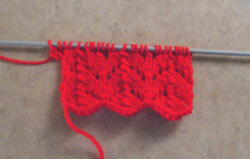 A quick peek at my initial swatch. Mordanting yarn that hasn’t been properly dyed is a real pain, it’s a shame that you’ve got this challenge on your hands. Vinegar can often set dye, but it isn’t a true mordanting substance, so it may not fix it as well as you’d like. I’d try knitting up a swatch and soak it for some time in a vinegar bath before you go to the effort of winding skeins. You may have lots of the dye seep out, but if you get a nice grey yarn out of it, it’s better than getting rid of it entirely, and you’ll know to just soak and rinse the yarn until the water runs clear. BTW love the swatch! I can’t wait to see the final project! Yeah I’m pretty disappointed with that black wool. I’d be happy with grey wool too, so I may go ahead and hand wash and rinse it. I sketched out my sweater idea today so now the planning has to start. I haven’t designed for awhile because the last sweater I designed, although beautiful, it is too small. My gauge was off just enough that the sweater is one size smaller then I wanted. Of course it was a fitted sweater so there was no forgiveness. If I ever lose 10 lbs. the sweater will fit great :). This time I’m going to be more careful. I’m planning a light cardigan so it will be less fitted this time. When I get a chance I’ll post the sketch.